Here we are, in 1947. Orson Welles has received critical acclaim for his previous three films. This is the year audiences went to see Orson Welles' film-noir masterpiece, The Lady From Shanghai. The Lady From Shanghai, starring Orson Welles' wife Rita Hayworth. Sadly, The Lady From Shanghai was not a box office smash as it only made slightly over $7,000 and was made with a budget of $2,000,000. Michael O'Hara makes a tragic mistake. He was never a very bright man. Michael was born in Ireland and moved to America as an imaginary. Now, he's made the fatal error of falling for the seductive Elsa Bannister. The trouble is Elsa claims to feel the same feeling towards Michael. Elsa, being a married woman wants avoid being caught in a lie. However, her love does not allow her to part from Michael. Elsa's husband, Arthur is captain of a boat and when they are in-need to a new crew member Elsa' manipulates Arthur into hiring Michael. Time passes, and Michael has become accustomed to his new life until he gets involved in a deadly game of murder. Michael O'Hara: Maybe I'll live so long that I'll forget her. Maybe I'll die trying. (Taken from IMDB). The Good: Orson Welles delivers one of his greatest performance as an uneducated Irish immigrant. Rita Hayworth was always a great actress even though overall she was never in a large quantity of great movies. Without a doubt this is one of Rita Hayworth's greatest performance. Despite the fact that her character is not a particularly deep one, she does the best the writing allows. 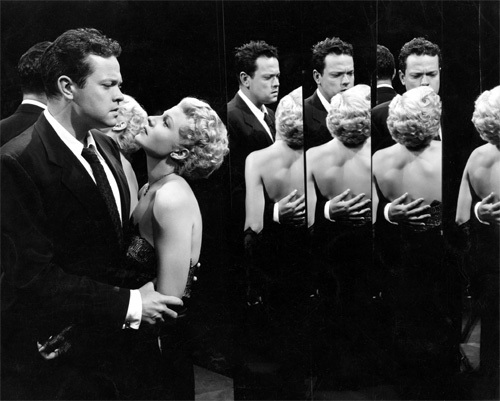 The screenplay for The Lady From Shanghai is to say the least, fabulous. It's only fault is not giving us in-depth character The dialogue is constantly original and clever. Finally, the image above of Orson Welles holding Rita Hayworth in his arm is just one of the many startlingly beautiful images of the movie. As if that wasn't enough, The Lady From Shanghai creates one of the most fun and clever courtroom scenes of all time. The Bad: The Lady From Shanghai's ideas aren't the most original. Idiot man falls for woman who uses him. We've seen this before in such films as Scarlet Street. As well, the characters are classic stereotypes that did not give the actors much room to expand and release their inner talent. The Ugly: Orson Welles creates a world of ugliness. Where everything is done for personal advantage and there is no respect.